I'm back again to spill more of my favorite places to eat in NYC. The first post I made about this has garnered a lot of views, so I figure why not share even more! Since publishing that post over the summer I've visited even more great spots. Click here if you haven't gotten a chance to read that first part, and keep reading if you're hungry for more! No matter how hard I try to not eat out so much I always end up out somewhere! For me, it's because I'm out for social meetings so I can't complain too much. When it's just me though, like on lunch breaks from work, catch me with my bagged lunch from home, haha! Anyway, as I mentioned in the first post, eating in NYC can be really hit or miss. I can't tell you the number of times I've payed for a pricey dinner and been disappointed, and that's the worst because then I feel like I've wasted money smh. Below are some of my tried and true spots that I've had great experiences and food at. Make sure to let me know in the comments below if you try any of these places! My friends and I LOVE this place. 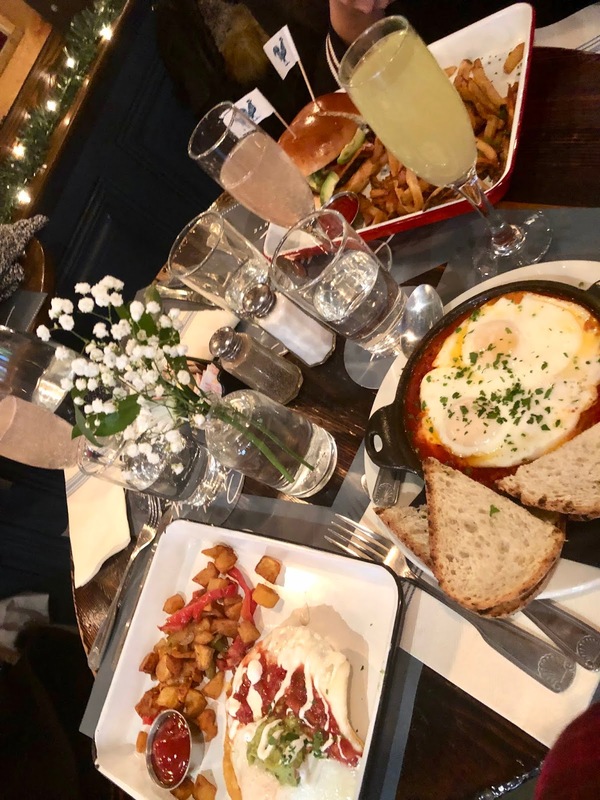 There's a really important and obvious reason why: bottomless brunch! The first time I went here was the middle of December, and I just went back and brought more friends the middle of January. The food is delicious and mid-range for NYC, expect to pay around 14-18 dollars for your entree. Bottomless brunch is $21 per person, which seems kind of steep (at least to my college student wallet) but is actually SO worth it. Included are bellinis, mimosas, and bloody marys (I didn't like this drink though). It's a whole lot of fun to sit there with a group of friends and just keep the drinks flowing for 1.5 hours! The only caveat is the wait time can be brutal. Reservations are only for groups of 10-17, and each time I've went has been almost an hour wait. It's totally worth it for me, the interior is cozy, the staff are really nice, and the crowd is hip and lively. The great brunch (which is pictured above) is really what keeps me coming back. My family friend brought me here for hotpot and I was so impressed with this place! A Chinatown gem, this is the type of joint all the trendy, cool young Asian crowd hangs out (including me). The interior is warm and super stylish, the soundtrack is usually rap music but not played too loud so you can still talk and everything ok. I love hotpot, and this place has top quality food. This does come at a price though, so you can expect to pay $40-$50. This is a great date spot or to be a group of course! I ordered the Plum Bellini as my cocktail and it was absolutely delicious, one of the best drinks I've ever had! Complimented my spicy, salty hotpot meats perfectly. I do recommend making a reservation as it does get busy. My lovely co-worker and friend, Frances, brought me to this joint on my last day on the job! I don't go to a lot of French places so this was a real switch-up for me. We came here for the happy hour and it was one of the best I've been to. I had a really delicious glass of red wine that was part of the happy hour thing, then we ordered one Ratatouille to share. I'd never had the dish before, the closest I've ever gotten to it was the movie haha. It was so delicious, it arrived in a little dish nice and hot with bread on the side. The waiter saw we were running low on bread and even got us more! The order was the perfect amount for us to share and feel decently filled up so it was great! I'd definitely recommend this place for happy hour and snacks, and would love to come back and try dinner sometime! I don't eat a lot of Middle Eastern foods either, and when my co-workers wanted to go here for lunch one day I felt kind of neutral about it. Was I shocked when I loved it! This restaurant says it is "contemporary middle-eastern" on its site, and it totally has a chic, NYC vibe inside its beautiful interior. This is from the same woman who founded By Chloe (a favorite of mine), and the price point is about on par. Expect to drop around $15 for lunch. You definitely get your money's worth though and feel full. I ordered the Shawarma Burger and had some sort of turmeric cookie on the side, both of which were delicious. This joint just opened in May 2018, and will definitely impress a hip crowd of friends. Seating is abundant so you shouldn't have a problem finding a spot and staying a while. I love matcha! One night after dinner, my friends and I were looking for a nice place to get little desserts and just sit a while. I found this place and fell in love. Matcha N' More has a cozy, very Instagrammable interior and an assortment of matcha-based drinks and desserts. I ordered the white chocolate matcha latte and a matcha cream puff. Both were delicious, and my friends all loved their ice cream. It was the perfect place to sit and chat, and the brand also sells some really cute matcha tees! Prices are about on par for NYC cafes, expect $4-$5 for a drink and the same for sweets. This spot is quiet and perfect for hanging out, especially in this cold weather! Check out their yummy Instagram here. Everybody knows Tao. I've always heard about this place of course, it's a legendary New York nightlife spot. This past week, I went to dinner here with a group of my friends to try out their Restaurant Week menu. This venue is elite, besides the extraordinary interior, which includes stereotypical "Asian-like" decor and a live DJ, the people who were frequenting this joint were clearly the best of New York. I was SHOCKED at how delicious the food was here, I was expecting it to be like Vandal, where the interior was cool but the food was really lackluster. I ordered the tuna tartar for my appetizer, Mongolian beef for my entree, and pineapple sorbet for dessert. It was AMAZING! My friends and I all loved our meals and really dug the atmosphere. We didn't stick around to hit the club part, but believe me we will be back for that. This place is worth stopping by, just make sure you have a reservation!